Some 23% of adults in Ireland smoke, the same proportion as in 2015. JUST UNDER A quarter of the adult population in Ireland smokes, according to the latest Healthy Ireland survey – and that proportion has not fallen since last year. Some 23% of adults in Ireland smoke, the same proportion as in the 2015 survey. Just under half of all smokers (48%) want to stop smoking, meanwhile – again, the same proportion recorded a year ago. Despite Government health warnings that one in every two smokers will die of a tobacco-related illness, one in every five people under the age of 25 smoke, according to the survey. Ireland was the first country in the world to ban smoking in the workplace back in 2004, and the Irish Cancer Society says there have been 4,000 fewer smoking-related deaths thanks to the ban. A fifth of all women smoke (20%), a lower percentage than men (26%). Women aged under 25 are more likely to smoke than men of the same age, the new survey found. 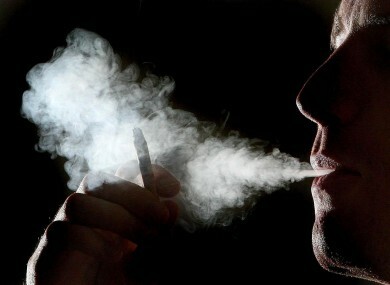 About one in five of all adult smokers (19%) smoke daily, while 4% say they smoke occasionally. Smoking will soon be banned in most Irish playgrounds, while the recent Budget2017 saw another 50c rise in the tax on tobacco. A similar proportion of the Irish population (18%) are exposed to second-hand smoke on a daily basis, meanwhile. Non-smokers in more deprived areas are more likely to be exposed to second-hand smoke than those in more affluent areas, the report found. There is good news, however. Among those aged 35 and older, there are considerably more ex-smokers (32%) than current smokers (20%). However the situation is reversed among those younger than 35: 14% are ex-smokers, but 27% are current smokers. The second Healthy Ireland Survey also found that just 3% of Irish people regard themselves as heavy drinkers. Some 97% of the Irish population regard themselves as teetotal, light or moderate drinkers, although almost one in every three adults binge drink regularly. In 2014, Ireland came second in a WHO list of countries with the worst binge-drinking, which is classified as drinking six units of alcohol (three pints, six small glasses of wine or six single spirit measures) in a single sitting. A majority of Irish males (55%) – and roughly one in every five Irish women (18%) see themselves as binge drinkers. A quarter of all Irish adults, however, do not drink at all. The study was based on 7,500 Irish people over the age of 15 surveyed by Ipsos MRBI. Email “Almost one in every four Irish adults smokes - and the numbers aren't falling”. Feedback on “Almost one in every four Irish adults smokes - and the numbers aren't falling”.